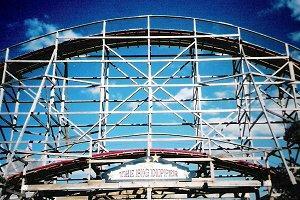 The Big Dipper, built 1926. With today's most popular amusement park rides being high tech engineering marvels, it is hard to imagine that the history of the roller coaster is actually more than 500 years old, but these exciting rides have origins that span centuries. The very first roller coasters bore little resemblance to today's sophisticated rides. In fifteenth century Russia, elaborate wooden slides were coated with ice to form slippery slopes that daring riders would brave while seated on ice blocks or sleds. For generations, these winter thrills were a social staple, and in 1817 the "Russian mountains" were adapted to warmer climates in Paris when wheels were mounted on carts to race down wooden slopes. German designers also added wheels to toboggans on wooden tracks, emulating the thrilling Russian ice slides. In 1826, Parisian designers added a rudimentary cable system to return cars to the top of the slope, and for the first time, the full potential of these exciting rides was seen. In the United States, roller coasters evolved slightly differently. Whereas in Europe the rides were always entertainment-oriented, in the United States the first coaster-type ride was the Mauch Chunk Railroad in Pennsylvania, which opened in 1827. This gravity-powered railroad was built to haul coal and facilitate industry in Pennsylvania's steel belt, but before the figure-eight loop was complete it had already become obsolete. Instead, it was outfitted as a passenger ride, and thousands of eager adrenaline junkies enjoyed the 18 mile ride. One of those passengers was La Marcus Adna Thompson, who in 1884 built the first patented roller coaster in the country, the Switchback Railway. This ride's undulating track along the Coney Island beach quickly became a popular attraction, and additional rides were built in several locations. As other designers began to make innovations, however, Thompson saw the need to make the rides more than just dips, and he created the Scenic Railway a few years later. While the ride's mechanics were the same as the Switchback Railway, the elaborate scenery made the mild roller coaster a visual and cultural treat as well. From these simple beginnings, roller coasters would begin to push the boundaries of speed, height, and excitement, and modern roller coaster design progressed at intense speeds that pushed riders to keep up with the latest thrills. During the twentieth century, roller coaster design experienced as many hills and dips as the most intense ride. The 1920s saw an unprecedented boom in the appeal of roller coasters, and new wooden coasters opened at a phenomenal rate. Passengers couldn't get enough of the steeper drops, faster speeds, and tighter curves in every new ride. Just as the decade was known for exciting and flamboyant culture, this era of excess was perfect for new roller coasters. During the 1920s, amusement parks boomed as well. More and more workers were moving to urban areas, and parks opened to provide them with weekend diversions, exciting dates, and thrilling sights that couldn't be found outside the cities. Flashy lights, innovative rides, and rich food were all a part of the amusement park atmosphere, but roller coasters remained a central showcase of the parks through the end of the decade. As the Great Depression hit and stretched to years of low wages and high unemployment, however, the high cost of building and maintaining roller coasters and amusement parks led to many rides being closed, sold, and ultimately, destroyed. Few classic rides remain from this golden age of the history of the roller coaster, but the public's love of thrilling rides was destined to return. In the 1950s, the amusement industry experienced a mild resurgence as the country recovered from decades of deprivation and enjoyed the prosperity generated by the explosion of industry during World War II. At the same time, however, as cars became faster and more fun to drive, fewer people were excited by the relatively tame classic roller coaster designs. To keep up with the thirst for adrenaline and faster, higher thrills, steel roller coasters evolved to new and impressive heights. Amusement parks, too, needed to change to keep up with consumers' evolving tastes. Parks began to relocate from urban centers to resort destinations, and in 1955, Disneyland theme park opened and redefined the idea of a theme park as a total sensory and fantasy experience. 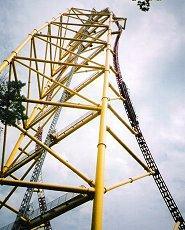 Top Thrill Dragster, built 2003. The modern history of the roller coaster is one that takes place primarily in the past 30 years, as steel coasters have mutated into a tremendous range of thrilling rides. From classic oval tracks and gentle rides, steel coasters have branched out to an amazing variety, including suspended cars swinging beneath the track, shuttle coasters that go forwards and backwards, inverted coasters that dangle riders' legs above the ground, stand-up coasters that add new pressure to remaining upright, and more. Today's coasters are also exploring new avenues of propulsion to make even the beginning of the rides more exciting, and different types of hydraulic launches, electromagnetic motors, and other new technologies are thrusting coasters higher than ever before. Even the size of roller coasters is evolving. In the 1920s, a huge coaster might barely top 100 feet tall, but in 1989, Magnum XL-200 at Cedar Point broke the 200 foot height barrier, and today rides such as Top Thrill Dragster at Cedar Point and Kingda Ka at Six Flags Great Adventure challenge riders to endure thrills at higher than 420 feet and speeds well over 100 miles per hour. Where will the future history of the roller coaster take eager riders? As technology advances, there is no telling what heights new coasters may reach or at what speeds they will get there, but one thing is certain: there will be plenty of riders waiting to strap in and enjoy the ride.